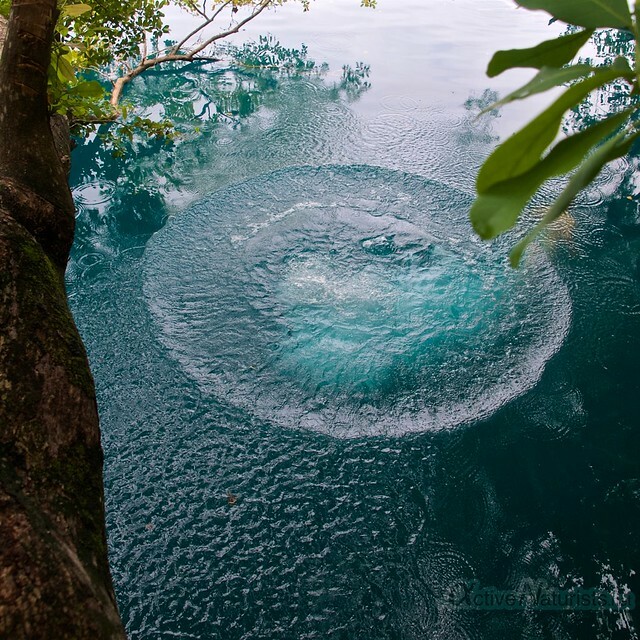 Cenote Azul is nothing less than an amazing body of water – azure, clear water that goes immediately into abyss, right off the edge of its shore. 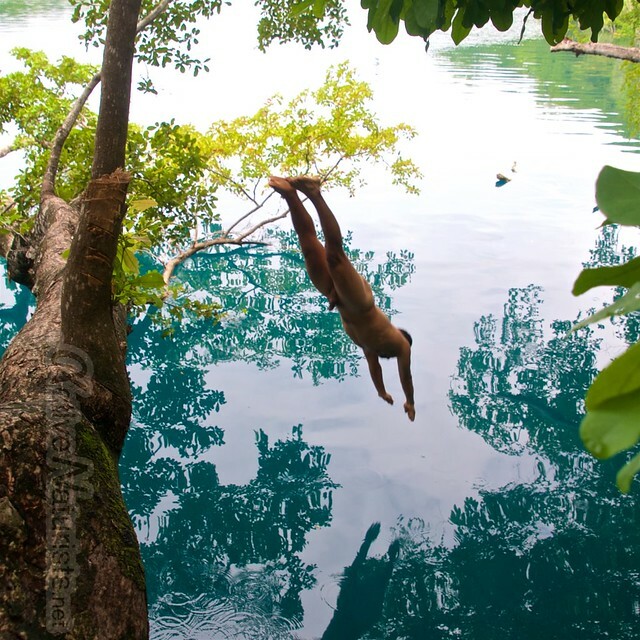 We’ve already described quite a few cenotes in the vicinity of Tulum and Merida, Yucatan. 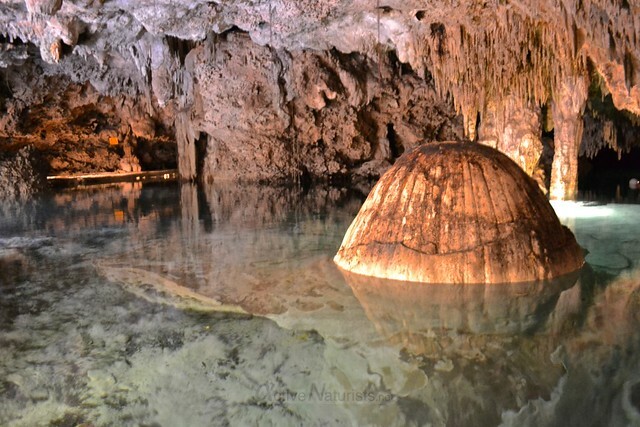 Each cenote is different, but this one is very special. For once, it’s really huge, for a sinkhole, which it essentially is, and it’s right next the world famous resort at the lake Bacalar. So, I was very skeptical of a possibility to enjoy this nature’s wonder au naturel, but luckily I had my local CouchSurfing host George to show me around – and he knew where to go. Most of the shore is covered in vegetation, and there is a “hidden” access across from the tourist area with a restaurant. 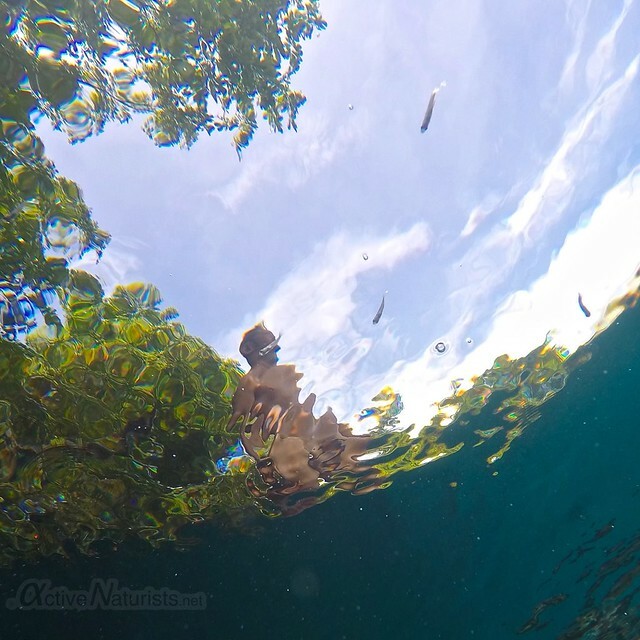 And is this how fish see us from below? 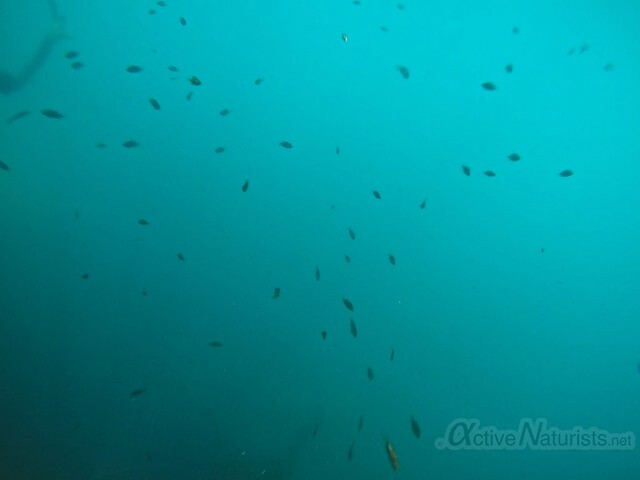 some swimming freely, and others attached to the underwater tree trunks. We felt like birds! … or bats? As we climbed the trees, we actually awakened some bats, quite a lot of them! We would never have noticed them sleeping on the trunks otherwise. and flew back into the blue abyss! 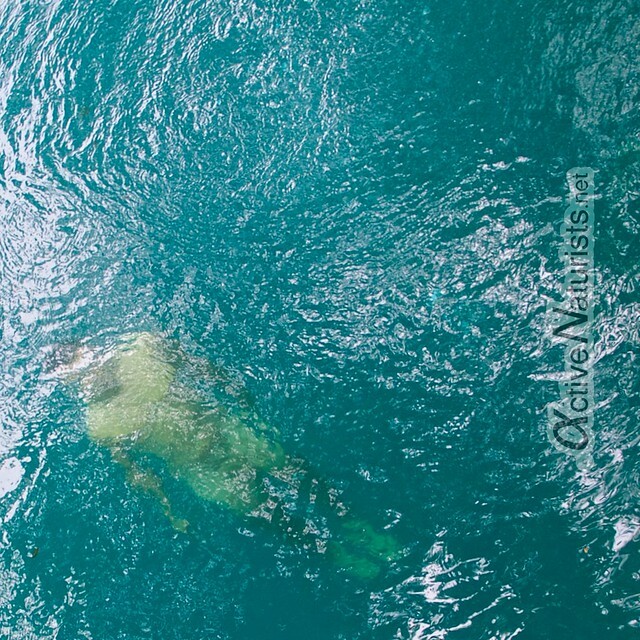 As you can tell by this story, Cenote Azul felt magical. It’s impossible to really express it with words and photography, but perhaps this video will do a better job. We found a description of Chaak-Tun in a travelog that made us believe it was a kind of untouched natural wonder. But when we arrived there, it became clear it was ready for mass tourism, just waiting for the road built next to it to get asphalted. The price was already quite steep, at 200 pesos (for foreigners, 60 for Mexican citizens). Nevertheless, we enjoyed the visit, and it was not crowded. There were two caves, both with stalactites and stalagmites. The second one did not have any natural light, so the mild artificial lighting was justified. 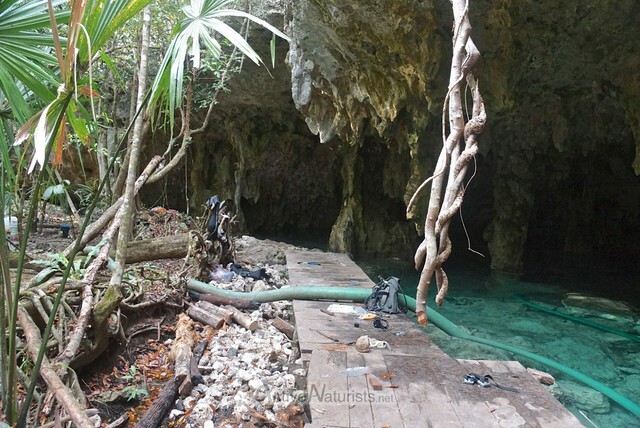 Another cenote that we visited in Tulum area was ¿Cementerio de Mascota? (Pet Cemetery). 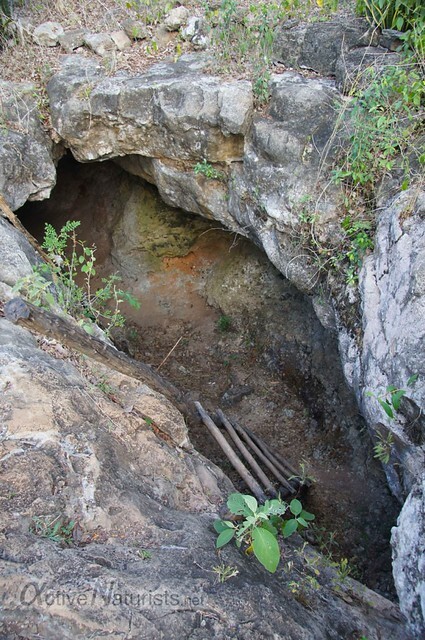 It was discovered recently and has not been fully developed for visitors (yet). 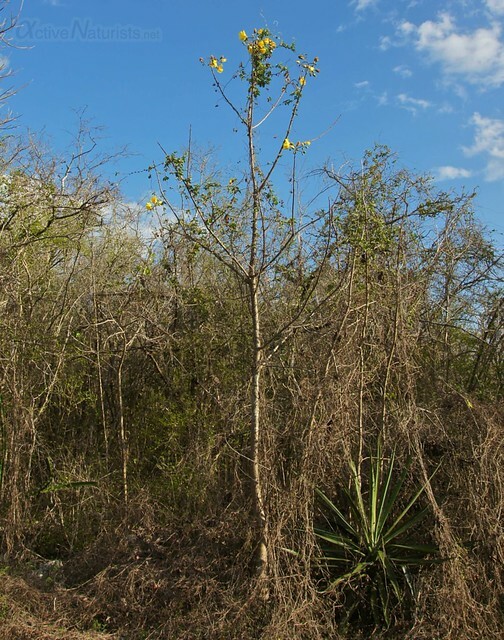 I put question marks around the name, because we are actually not sure if what we saw was cenote Cementerio de Mascota or an unnamed cenote in the same area. Tomas only knew that it was supposed to be further down the road that goes to the famous cenote Dos Ojos, and we got directions entering the park, but we never saw any indications to it, so we couldn’t be certain. 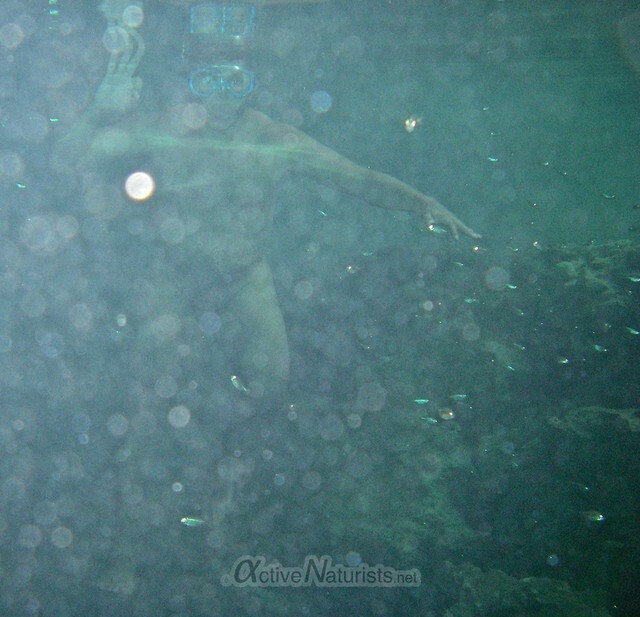 Once we passed the much-visited cenote Dos Ojos, we decided to continue the walk naked. 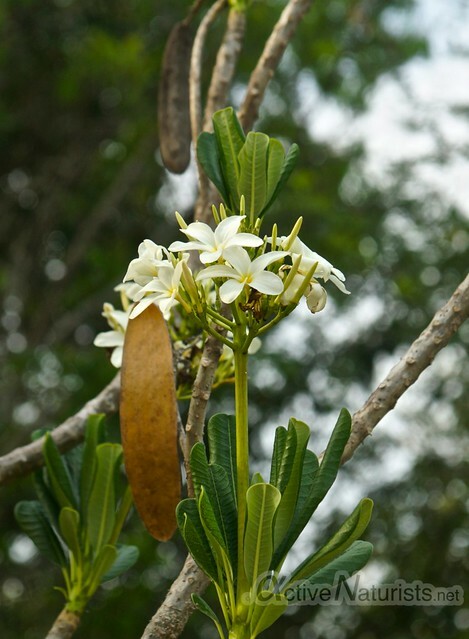 The forest was green as the rain season was starting, and some trees were blooming. 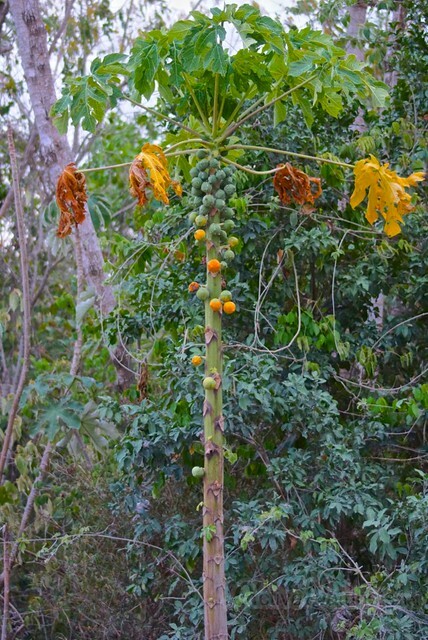 And some were even fruiting, like this wild papayo (papaya plant). 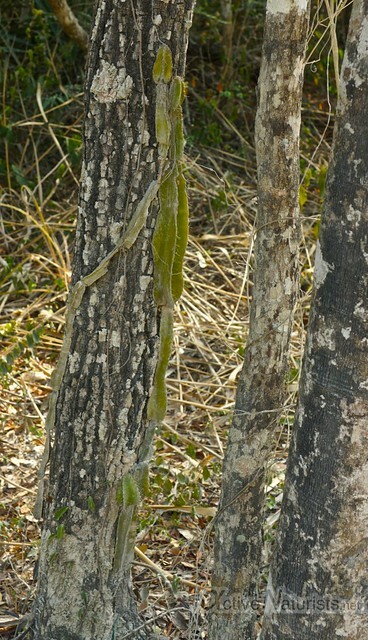 I liked those ‘tree-hugging’ epiphyte cactuses too (they reminded me of myself on the coconut palm tree). 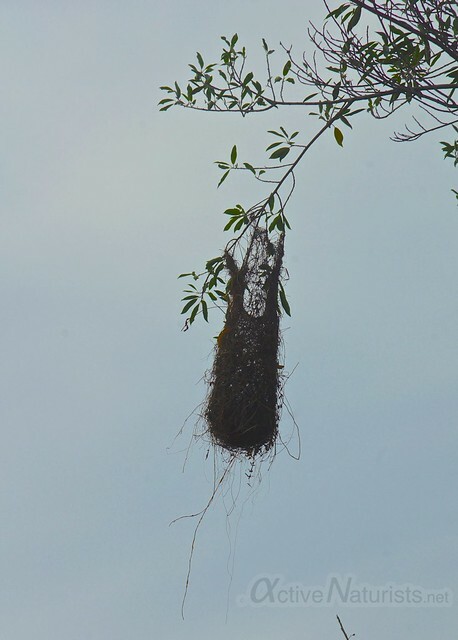 As the air was cooling down (it was late afternoon), more and more birds started singing, but we didn’t see the possessors of this hanging nest. Eventually, the road had a steep turn to the left, and there was a sign to cenote Sac-Actun (one of the longest underwater cave systems). We decided not to turn and continued in the same direction, passing through the wooden gates; but almost immediately after that, the road turned right. 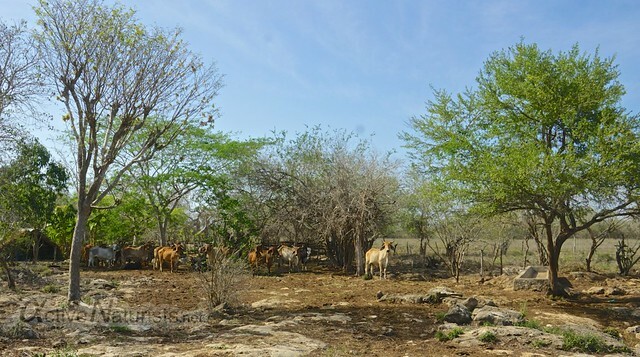 We were not sure whether it would bring us to Cementerio de Mascota, and decided to follow the road for not more than half an hour. We soon reached a spot with a layer of sand that seemed to have been washed out of somewhere… then we saw the pipe that was probably used for that and followed along it. 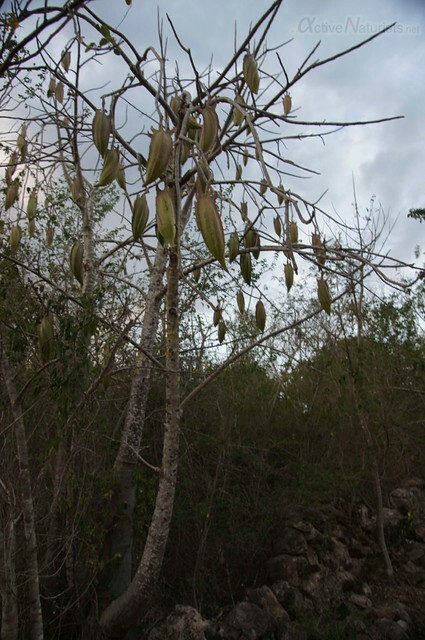 The trail was going downwards, and the trees were getting bigger and greener – a good sign of proximity of water. However, there was something weird about it. It almost looked like a crime scene! Or like people were rushed out, leaving their diving equipment, food, and half-full (or half-empty? :D) glasses of wine! 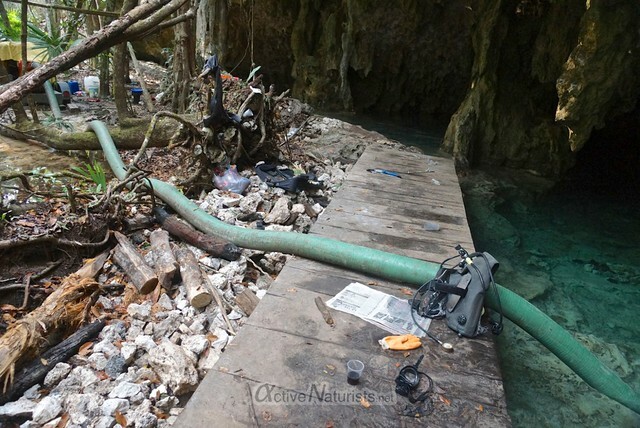 Well, what I guess in reality happened was that there were some ‘cleaning’ works on the site, which will eventually transform this cenote into another tourist attraction. To us, it would have actually been more attractive in its virgin state, but at least we could explore it a bit before it was going to be discovered by mass tourism. We snorkelled, and given the atmosphere of the place (and its name too! ), we were happy to have seen nothing but fish in water. After we got out of water, we heard some noise in the woods, then we saw the trees shaking! Almost as if someone was trying to fell them with brute force. 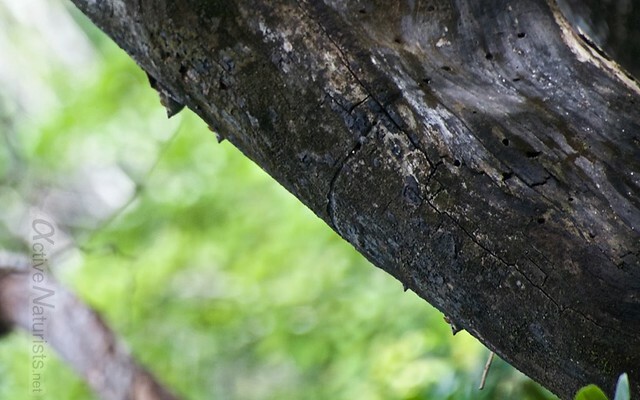 Soon we figured out what it was: monkeys were jumping from one tree to another. They were actually coming in our direction, so I quickly installed a telephoto lens on my camera. 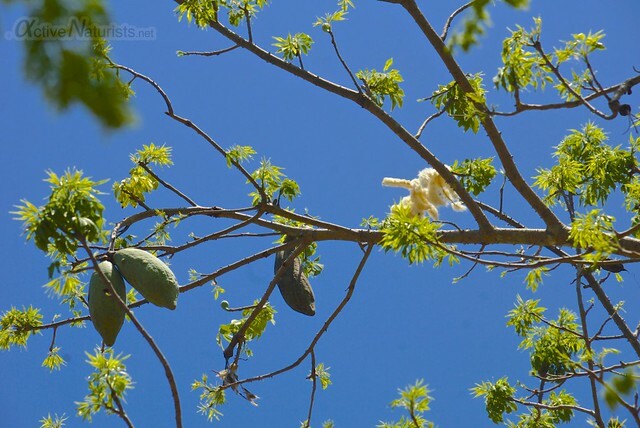 The monkeys got quiet for a moment… and then they reappeared right above us! But they moved so fast in the canopy that we didn’t manage to get any decent shots. 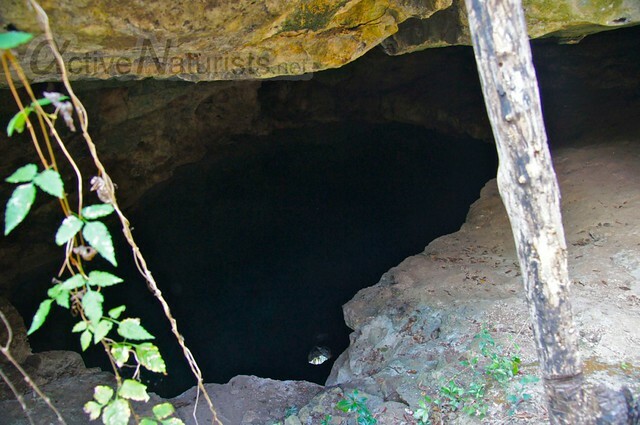 On the way back, we stopped by another small cenote just a bit off the road to/from Dos Ojos. It made a perfect refreshing skinny-dipping experience before we would get back to the main road to catch ‘camioneta’ (minibus) to Tulum. 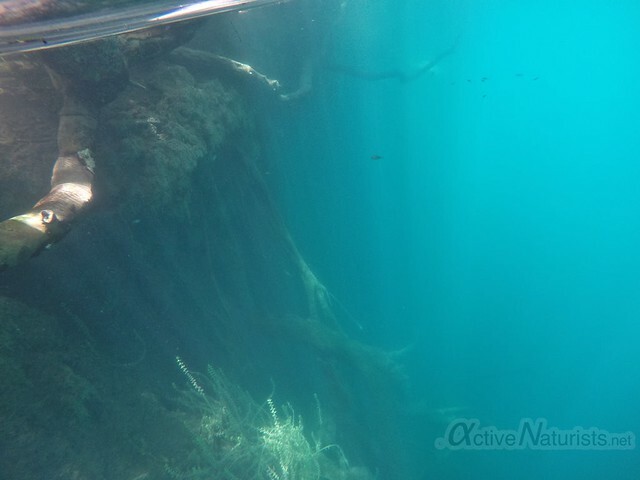 A couple of days later we were joined by Miguel, who showed me some less known cenotes previously. 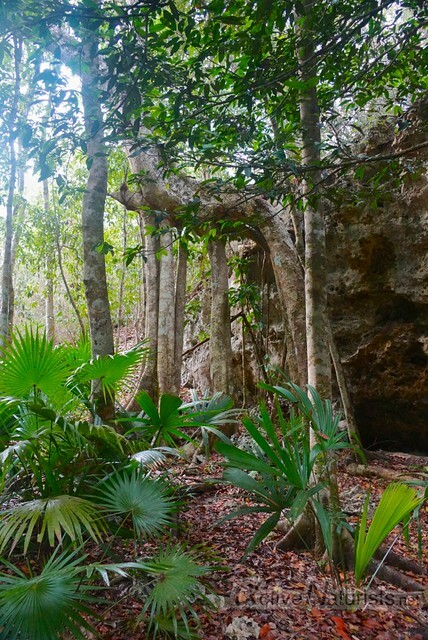 This time we wanted to see recently open cenotes in a place that was called, very promisingly, Cenotillo. 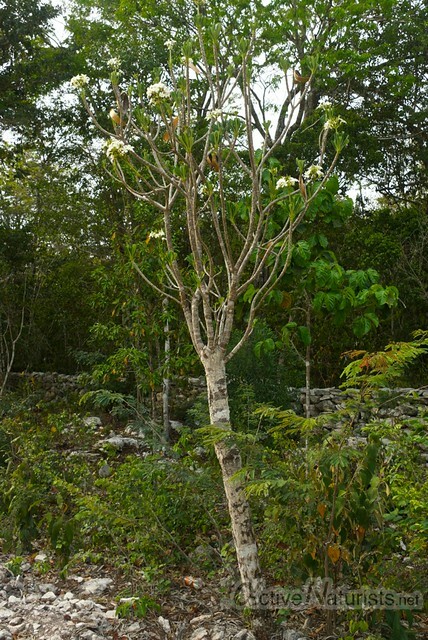 Apparently, Cenotillo boasts more than a hundred of cenotes! We had a map that listed just a few of them. Cenote Usil (Ucil) seemed to be the closest to this little town. Probably for this reason, there was some rubbish around but surprisingly there was nobody there. 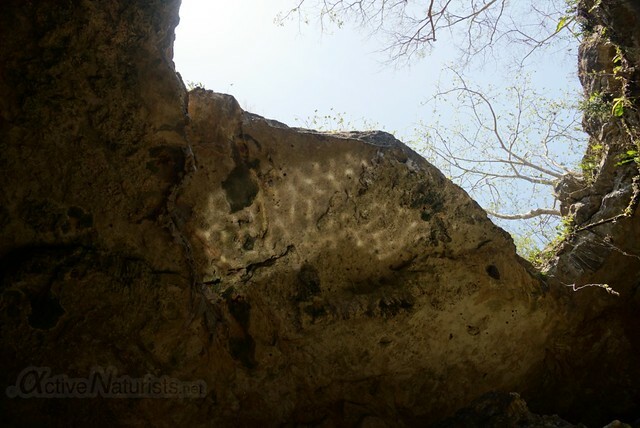 It was the perfect time of day to see solar reflections on the roof of the cenote. We were up to visit more cenotes, so we left pretty soon. By the way, cotton trees seemed to dominate the forest around Usil, but I preferred them to keep the cotton for themselves. 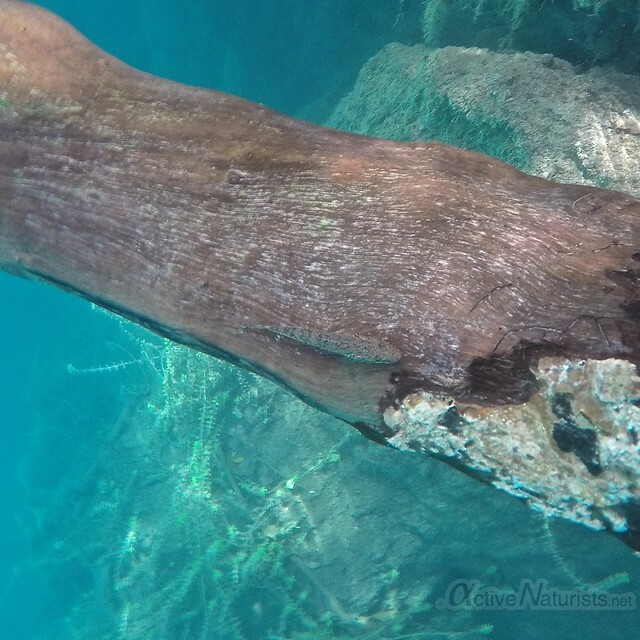 I don’t mean that just because we didn’t need clothes in that weather, but also because quite a lot of that fibre was accumulated on the water surface of cenote. 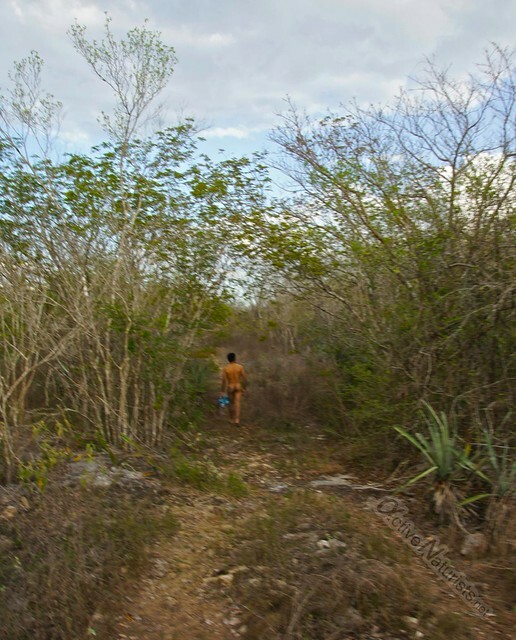 After that, we went back to the village in hope to ask for directions for other cenotes. Local police happened to be the best at giving advice, and we were even escorted by a policeman to a guide-vigilante Dani who curated some of the cenotes just recently open to public. 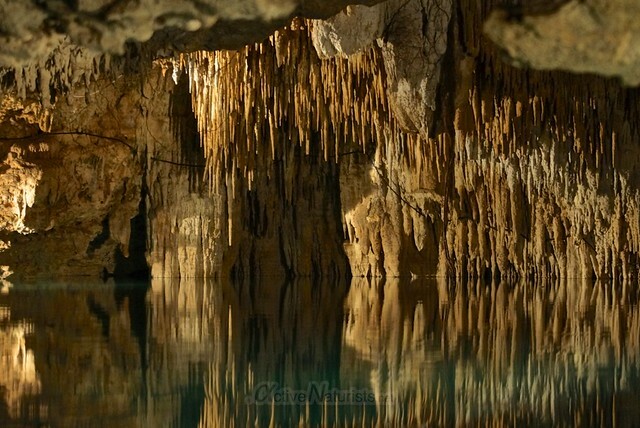 The first one we went was cenote Xoch. Luckily, Dani was absolutely cool with the idea of naturism and didn’t even blink when I got naked while walking through the forest on the way to cenote. 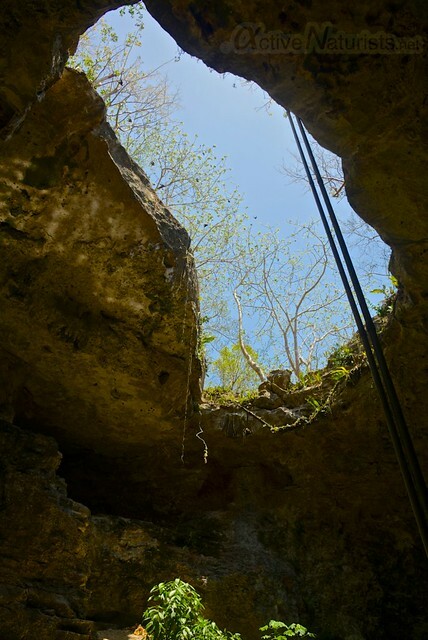 We were truly amazed when we reached the cenote. It was almost as big as the Sacred Cenote at Chichen-Itza. Unfortunately, to my view at least, they’ve already made some basic constructions next to it, but hopefully there won’t be much more than that. 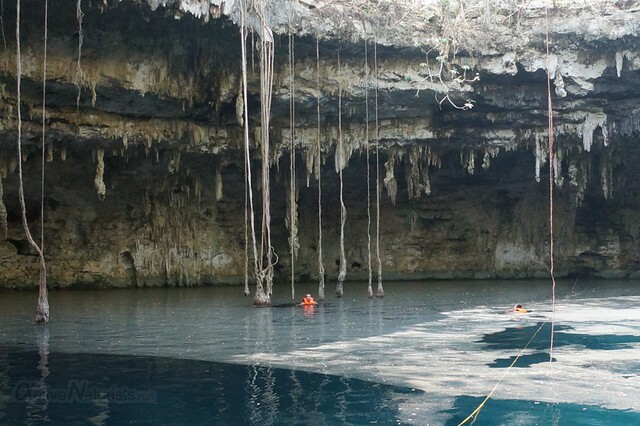 Another disappointment came from the strictly enforced rule of wearing life vests, because “the bottom of cenotes hasn’t been explored yet”. 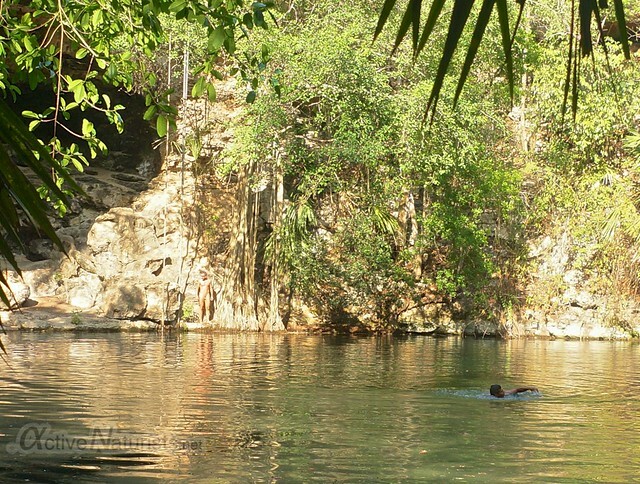 Then we went to cenote Kaipech. 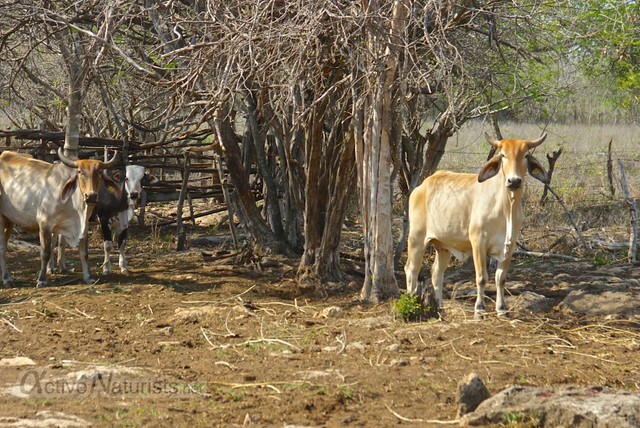 It was next to a cattle farm, but nobody was around; the cows seemed to be intrigued by our appearance. 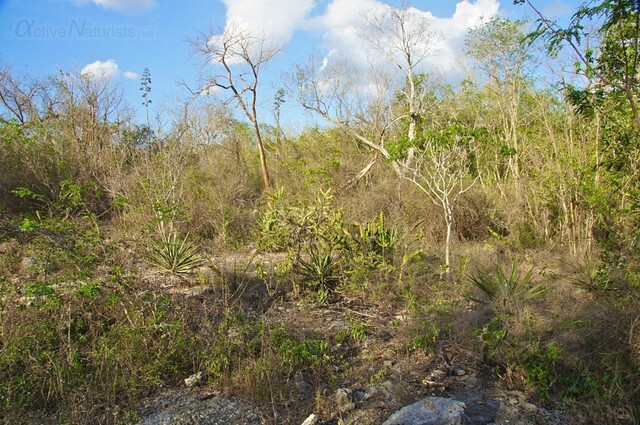 Despite being next to the farm, Kaipech was probably the least developed cenote of this scale that I’ve seen! There was no ladder, so we had to go down by the rocks (luckily trees and their roots were of great help with that), but this is what made this cenote my favourite one perhaps. We cleared the entry point of floating rubbish and went for a swim. This place seem to be teeming with wildlife. Judging by the constant buzz in the distance, there was a beehive around, so one has to be careful not to come too close to it. I also saw a basilisk, aka Jesus Lizard because of its ability to run on water, but this time it was just sunbathing on a branch above water. 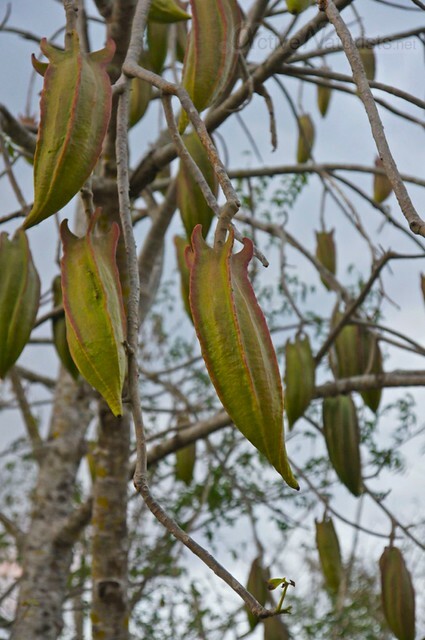 The seeds on the photo below are “snakes’ food” according to Dani, but it is hard to believe that, as all snakes are exclusive carnivores, as far as I know. 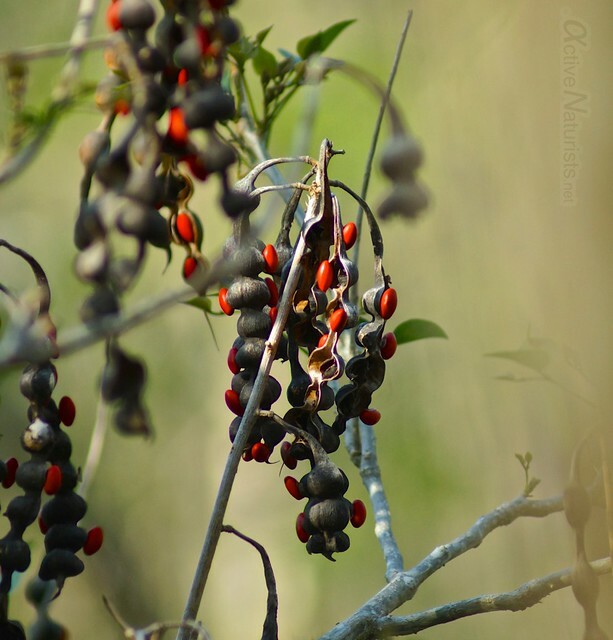 I wouldn’t mind sitting there for a while and observe if any snakes come to eat those berries. 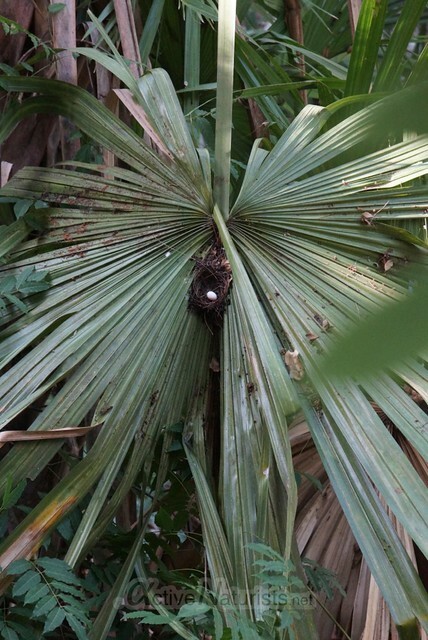 There was also a nest with one egg that could be easily seen, but I guess the trick was that it was on a palm tree leaf right above water, so any crawling intruders were likely to fall down. 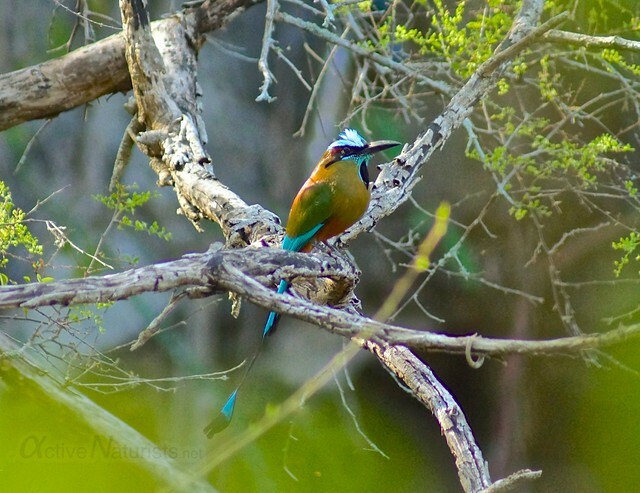 As usually near cenotes, there were some blue-crowned motmots, locally known as ‘pajaro toh’. These birds are brightly coloured and have various distinct calls. 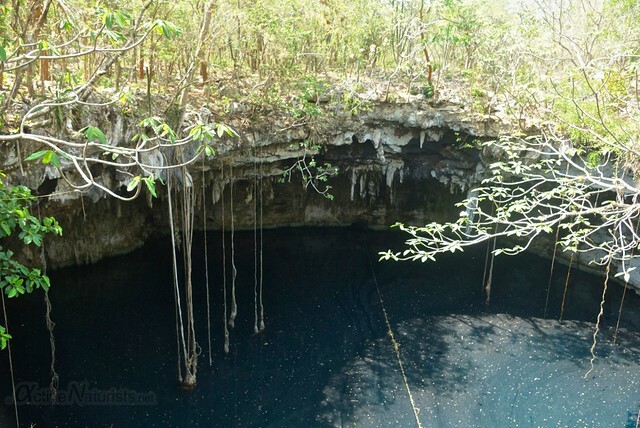 I can still hear them calling to visit those picturesque and yet mysterious cenotes! 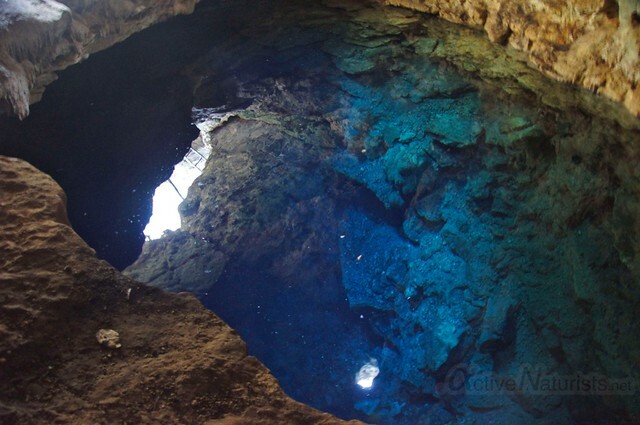 Frankly, before going to Mexico, I had never heard the term ‘cenote‘, which refers to a deep natural sinkhole, typical to Yucatan peninsula, but as soon as I heard the description and searched for images, I had no doubt I had to see those! They’re very different in appearance, size, history, accessibility. 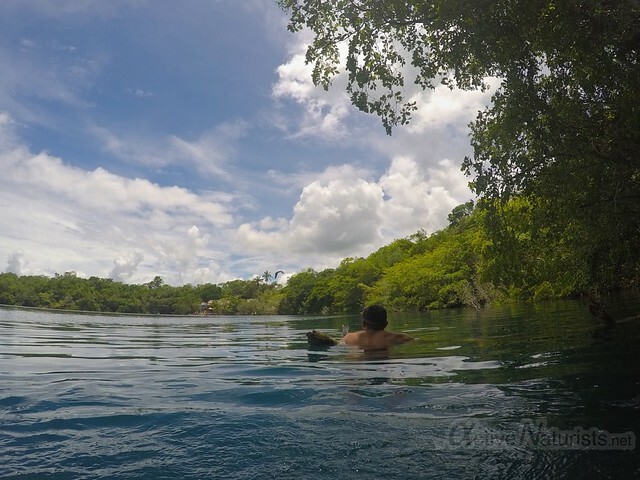 I’ve seen several cenotes, including the Sacred Cenote of Chichen Itza, but I was impressed most with two smaller but more secluded ones, that I was able to visit thanks to Miguel (who I got to know thanks to Couchsurfing again – have I mentioned how much I value that site?). 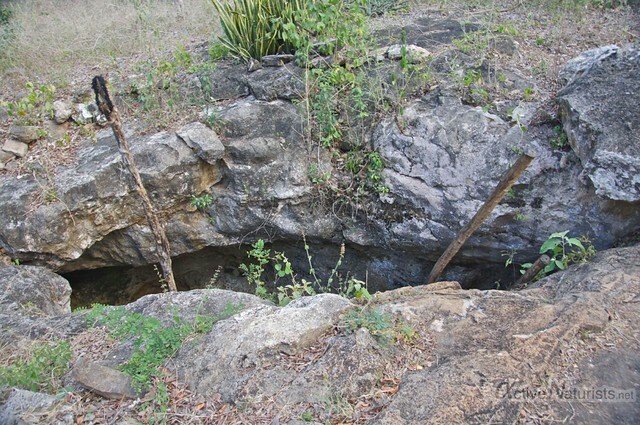 So, imagine yourself in a dry forest, and then you see a hole in the ground like this one. It’s just slightly bigger then the rabbit’s hole that brought Alice to Wonderland, and it feels like something magic is waiting for you there. It has a simple ladder that invites you to go down. But in fact, it’s just a reflection of the entrance, because the water is so clear, you can barely see it from above! 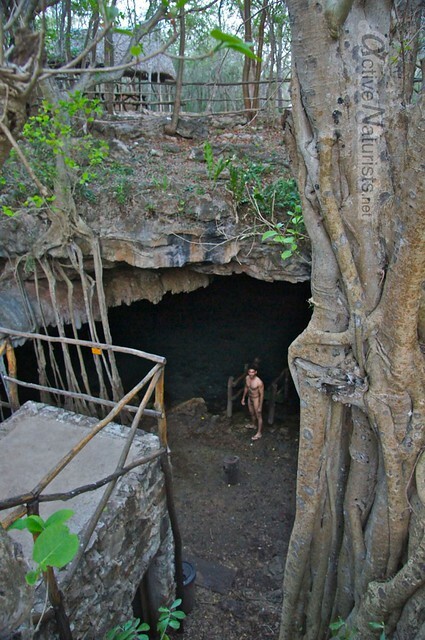 When we arrived to this cenote, we were lucky to have no one else around, so surely enough I got naked. 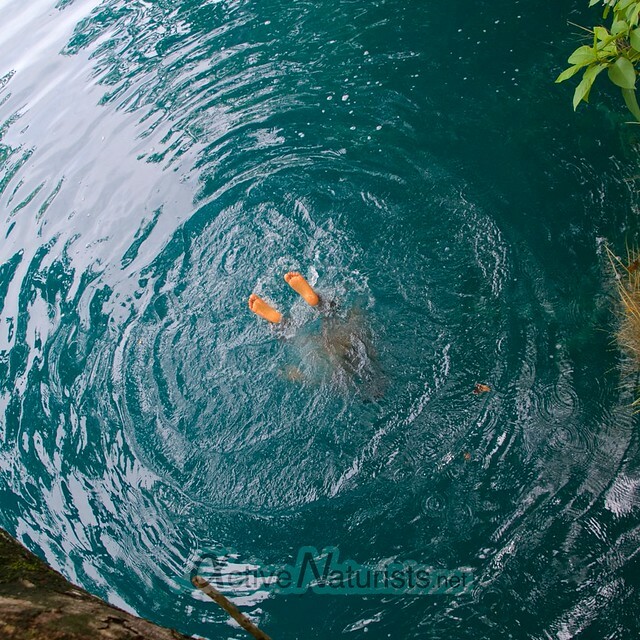 Skinny-dipping in cenotes, definitely something to remember! After a while we heard some people approaching to the cave, but it was the time to go further anyways. 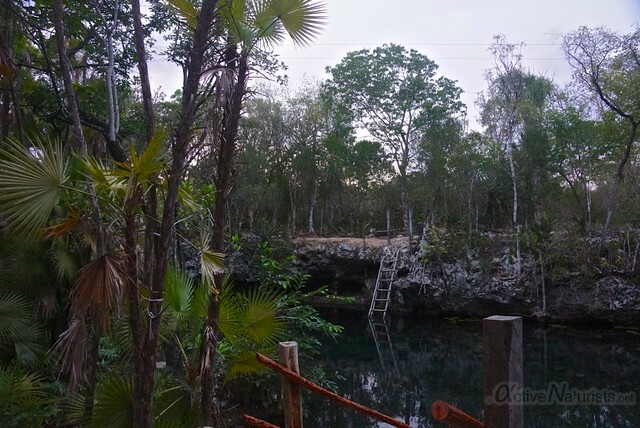 This truly marvellous cenote is called Dzom-Bacal and is located in the end of a dirt road in the midst of a deciduous tropical forest south of Merida. Since the road was barely used, we felt comfortable to bare it all and enjoyed our walk in the buff! It felt so right in that warm and dry weather. 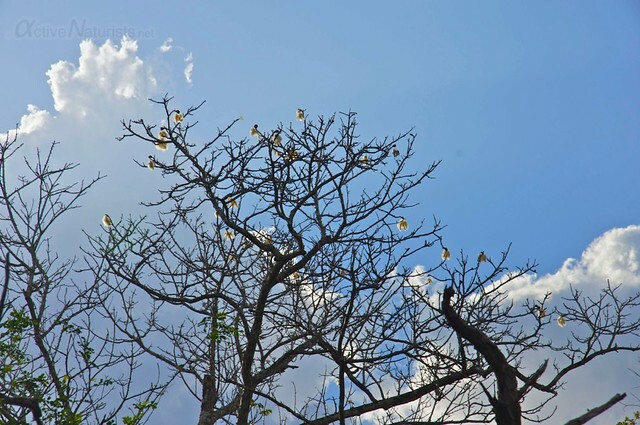 As it was just the beginning of spring, which in this part of the world is linked not so much to the warmer weather but to the arrival of rains after dry ‘winter’, most of the trees didn’t have leaves were naked too. 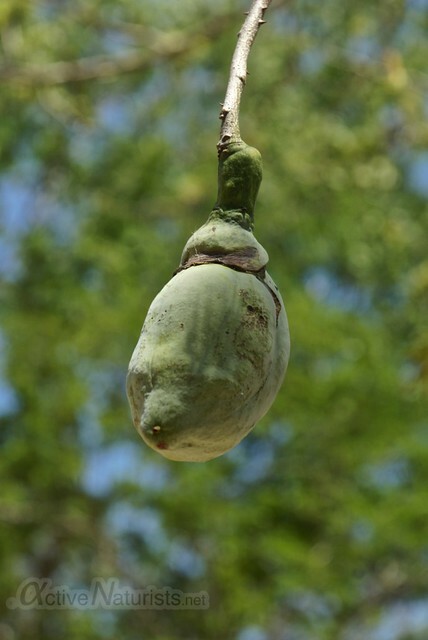 Ironically, the most naked tree of all was a cotton tree, easily distinguishable by its fruits with cotton fibres. 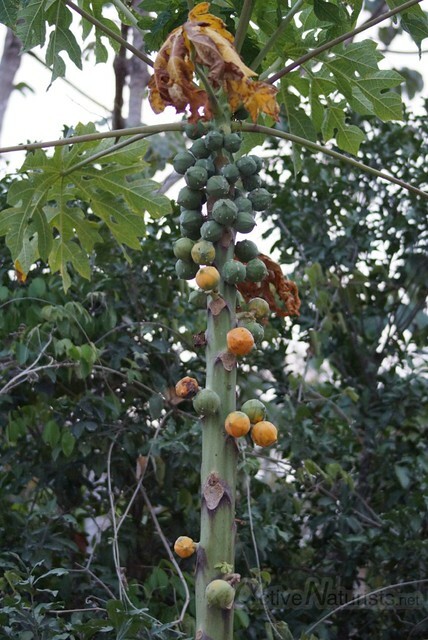 Boneto tree was also full of fruit, but they were not ripe. except for the parts where barren limestone didn’t let plants to grow over. just to look at some flowers once in a while. 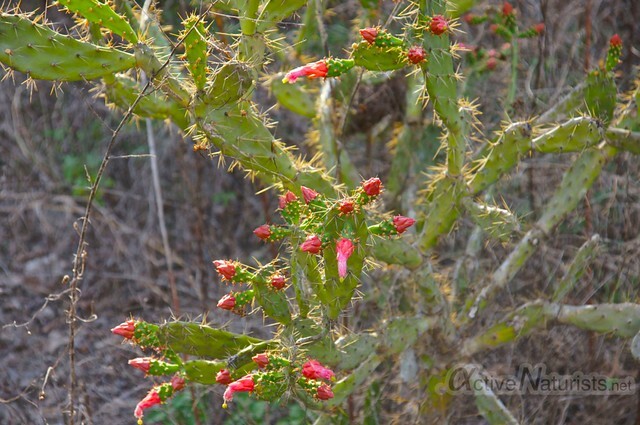 I used to have a similar species of cactus at home, it was nice to see its wild counterpart in natural habitat in a blooming state. Some trees started blooming too, I bet this forest was going to turn into a beautiful garden as soon as rains would become more frequent. It was so nice to walk there just like that, surrounded by beautiful nature and caressed by the rays of the setting sun. We found a trail that didn’t seem to be used by cars at all, but unfortunately we didn’t have much time to explore it. 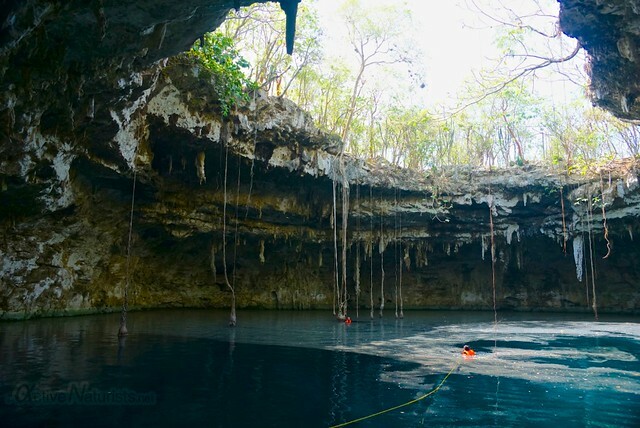 We wanted to see one more cenote in the area, X-batún. This one looked a little more developed and touristy, but probably because we came so late, last visitors were leaving just as we arrived. So, guess what, we were lucky to be able to go skinny dipping in X-batún too! 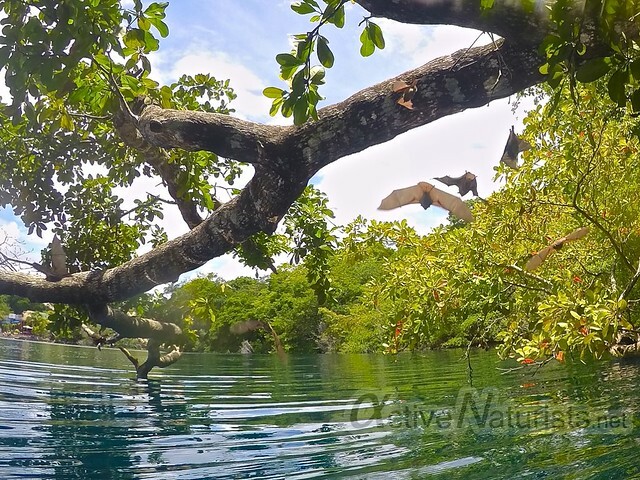 This cenote was more open, so banyan trees hung their long roots graciously from the edge of the upper level all the way down to the water. We let it all hang out too, and enjoyed a bit of splashy splash time on the warm evening.